WHY IS YOUR CHOICE OF JEWELRY ESSENTIAL TO YOUR STYLE?! Your choice of jewelry can make your outfit or clearly break it. We like to say jewelry is the cherry on top always. Wether it is a statement pair of earrings a gorgeous necklace or bracelets, jewelry is always popular and adds that special touch to your style. Not only is jewelry extremely significant to us during all our human cultures and throughout history, it is always popular as well. Different decades had specific styles to show and as the fashion world un ravels and plays so does jewelry and all designers involved. For many woman jewelry is a way of treating themselves by also knowing they've made an ever lasting investment. Eventually pieces get passed on to daughters granddaughters or daughter in laws and hold tremendous significant sentimental value. Like we see so often fashion items from decades ago coming back into style and sometimes get re purposed into something cool and trendy so does Jewelry. With all that being said, keep your eyes on the jewels and stay fabulous at any event! 17 OF THE MOST BEAUTIFUL TIARAS OWNED BY THE ROYAL FAMILY! A tiara is a jeweled ornamented crown which is usually worn by woman, and the royal family has quite a collection to their disposal today. We gathered a list of 17 beautiful tiaras owned by Queen Elizabeth today we are absolutely in love with. Meghan Markle's Tiara will have its own segment in our next blog. The Committee of The Girls of Great Britain and Ireland gifted this Tiara to Queen Mary on her wedding day. This is where this beautiful Tiara gets it's name from. It is frequently seen as it gets worn often by the royal family and photographed. This crown was worn by Queen Elizabeth II for her coronation. The crown is set with over 1,333 diamonds, one of the Queen's most frequently worn crowns. It was originally made for King George IV for his coronation in 1821. Queen Victoria and Queen Mary also wore it. When the Queen was gifted 100 Burmese rubies on her wedding day, she decided to have them made into a diamond and ruby tiara. The diamonds were used from a different tiara that was taken apart. 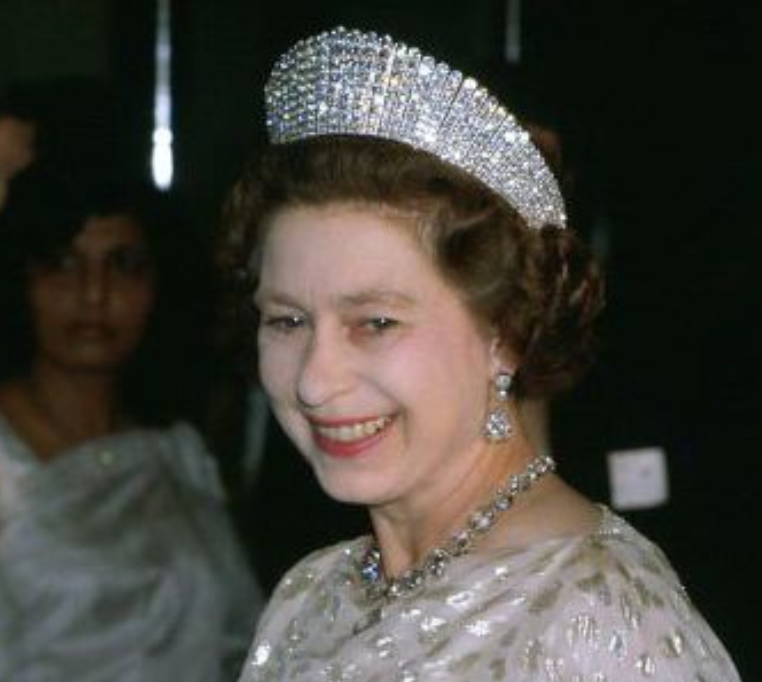 The halo tiara was gifted to Queen Elizabeth II by her mother Queen Mother on her 18th birthday. The Duchess of Cambridge Kate Middelton wore it on her wedding day to Prince William. Princess Margaret was also seen wearing it. It was made by Cartier in 1936 and gifted to Queen Mother by her husband. The Oriental Circlet Tiara was Queen Mother's favorite Tiara. It was designed by Prince Albert originally for Queen Victoria. Queen Mother passed it down later to Queen Elizabeth II. When The Queen was being coronated, Brazil gifted her a set of Aquamarine jewelry. The Queen had a Tiara custom made to be matched to her Aquamarine jewelry set. It is said that the Crown keeps growing, with new stones The Queen was gifted recently. This Tiara is most famous for being worn by Queen Elizabeth II for her wedding day as well as being worn by Princess Anne, but it originally belonged to Queen Mary and was custom made for her in 1919. This gorgeous Tiara can also be converted into a necklace and worn as such. This Tiara was passed down to Queen Elizabeth II by her grandmother Queen Mary. It originally belonged to the Russian Grand Duchess Vladimir and was sold to Queen Mary after. This Tiara is also one of many beautiful Tiaras, that were passed down to Queen Elizabeth II and she is frequently seen wearing it. It was originally a gift to Queen Alexandra by The Ladies of Society for her wedding anniversary. The Queen gifted The Cambridge Lover's Knot Tiara to Princess Diana as a wedding gift. It is most commonly associated with her and also often seen on the Duchess of Cambridge Kate Middelton. Originally it was made for Queen Mary. The Lotus Flower Tiara was originally comissioned to be made by Queen Mother. Its original state was a necklace which was then re designed into a tiara. The Duchess of Cambridge is often seen and photographed with it. Princess Margaret also wore it quite often. Dame Margaret Helen Greville owned this tiara originally and gifted it then to The Queen Mother. The Duchess of Cornwall wore it on her wedding day to Prince Charles. She is still often seen wearing it. This is one of the largest Tiaras owned by The Royal Family. It was passed down to Queen Elizabeth II and originally belonged to Queen Mary. The Duchess of Cornwall favors this tiara a lot as seen on this picture. Princess Anne was given the Meander Tiara by her mother in law Queen Elizabeth II. Princess Anne let her Daughter Zara Phillips wear it on her wedding. This gorgeous Tiara and one of our favorites was often worn by Princess Diana the Princess of Hearts. It came straight from her family and was borrowed by both her sister as well as her sister in law on their wedding days. This Tiara was sold in 2006 at auction for 926,400 Pounds. Long after it was given to Princess Margaret by her mother, Queen Mother. The occasion was Princess Margaret's wedding. 17. AND FINALLY ... THE GEORGE VI SAPPHIRE TIARA! The Queen was gifted Sapphire jewelry by her father on her wedding which she used to create this Masterpiece. The Sapphires were originally purchased by George VI. That is where the Tiara gets it's name from. 3 THINGS YOU MUST KNOW BEFORE BUYING AN ENGAGEMENT RING! 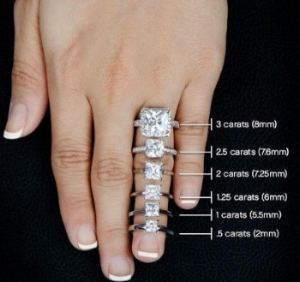 3 Must know about engagement rings. If you’ve been looking into different metal options for your engagement ring, wedding band, necklace, fashion ring, bracelet, or earrings, you likely know that platinum is a popular choice for several of different reasons. In fact, it’s 30 times rarer than gold. While 2700 tons of gold are converted into jewelry annually, only 88 tons of platinum are mined for jewelry. The color of platinum stays true for a lifetime. Its color will never change or fade as you wear your ring. If you prefer to keep it brilliant, the metal can be buffed with a soft cloth to return its original luster. Maintain platinum’s brilliance by occasionally soaking the metal in a mild solution of warm, soapy water, then scrubbing gently with a soft-bristled brush. Prongs made with platinum resist breaking, it’s the favored metal for protecting diamonds and other gemstones. Platinum’s strength, density and resistance to corrosion ensure that even the most delicate of prongs will keep your diamonds and gems secure. It’s an ideal choice for people who may be sensitive or allergic to other precious metals. That’s a fancy way of saying that platinum resists tarnishing. Platinum is a metal with substance: 60% heavier than 14k gold and 40% heavier than 18k gold. The density and weight of platinum mean that it holds up exceptionally well to time and to daily wear, so it’s rarely necessary to re-shank or reinforce a platinum engagement ring. When it comes to expressing your love, platinum’s natural attributes make it the ultimate symbol for representing a lifelong relationship. Its beauty is here to stay. A rose gold wedding band symbolizes epic love, whether you choose to pair it with a rose gold engagement ring or an engagement ring of another metal. That’s not to say that rose gold wedding bands are only for women rose gold wedding bands are also a classy and distinctive choice for men. The main attraction to 18k rose gold, then, is not the pink color. In fact, the color differences between 14k and 18k rose gold mean that, when put side by side, the 18k rose gold appears more yellow. This is because 18k rose gold contains more pure gold. Like 18k white gold or yellow gold, 18k rose gold contains 75% pure gold. The result is a softer, more malleable jewelry metal that contains a higher quantity of gold and therefore costs more. However, despite the increase in price due to the larger amounts of gold, most people prefer the color of 14k rose gold. Like this rose gold band above you can pair it with a white gold engagement ring as well as a rose gold engagement ring. When pairing a rose gold wedding band and rose gold engagement ring make sure you pair it with the same rose gold as mentioned before because of the 14k or 18k sometimes the rose can look a little yellow and you want to make sure it matches! Nowadays, more and more men and women are purchasing rose gold jewelry, specifically when it comes to engagement rings. Rose gold is a combination of two different metals, typically 75% gold and 25% copper, which gives it a unique, blush appearance. The specific color of the metal depends on how much copper has been added to the mixture and the more copper you add, the rosier it appears. What is the History of Rose Gold? Rose gold was originally called “Russian Gold” because it first appeared in Russia in the 1800s and quickly became extremely popular throughout the country. During the Victorian Era, this popularity exploded onto the fashion scene and quickly spread to the rest of the world, staying that way for a couple of years. The first, and often most appealing, benefit of rose gold engagement rings is their durability. Gold on its own is typically a pretty soft metal, which means it’s susceptible to wear and tear as you go throughout the day which can, eventually, lead to serious damage. Rose gold, however, is an alloy that is infused with copper. This means that it is much more durable than gold alone and better able to withstand the battering of everyday life. One of the most appealing features of rose gold is the fact that it naturally complements almost every skin tone. From dark to very light, it doesn’t matter what skin color you may have, the color of rose gold looks fantastic on just about every finger. Copper is a relatively inexpensive metal to produce, which means that it can sell for less than pure gold or platinum. Additionally, since rose gold is a darker metal, it’s actually recommended that you pick a diamond that is a little lower on the color scale. Traditional white gold and platinum settings contrast with their diamonds, which means that you’ll typically want to purchase something in the colorless D, E or F range in order to avoid having a yellow tint in your stone. However, rose gold will naturally add a yellow tint to your diamond regardless of the clarity. Yellow gold offers a classically romantic look in engagement ring settings. While there’s a moment for every metal type, yellow gold has historically been a popular choice for both wedding and engagement ring settings. We love how this lustrous precious metal looks in both vintage and modern settings. Gold is experiencing a major comeback in the jewelry world right now. And luckily, yellow gold engagement rings are as classic and beautiful as they come. Forget the popular platinum, white gold, this traditional bridal bling is both timeless and stylish. The yellow metal trend kicked off thanks to the unique vintage and retro inspired yellow gold engagement rings. 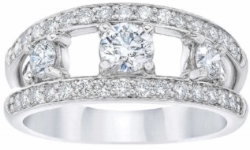 Whether you want an artfully band with accents, a classic round-cut diamond, or an elegant emerald cut ring. You can even take the look a step further and pair a colorful stone another big trend, especially among celebs with a yellow gold setting for a full on vintage effect. Cushion cut diamonds seem to be an increasingly sought after choice for engagement rings, perhaps because this shape combines enchanting shimmer with a distinctive look and a romantic, subtly vintage allure. The cushion cut originated from an antique cut that was at times called a “candlelight diamond,” because it featured large facets that were designed to sparkle in candlelight in the days before electricity. The cushion cut is a square shape with softly rounded corners that make it subtly resemble a pillow. The proportions of a cushion cut vary with the individual diamond, with some appearing more long and narrow, others closer to square. Cushion cut diamonds look stunning in many engagement ring designs. The combination of a cushion cut diamond and a halo setting is an especially sought after engagement ring style, perhaps because both the cushion shape and the halo design have a vintage ninspired look. Marked by a band that elegantly splits into two delicate strands of precious metal to frame the center gem, split shank engagement rings offer a look that’s as on-trend as it is classic. WHAT IS A SPLIT SHANK ENGAGEMENT RING? A split shank engagement ring features a band that splits into two as it reaches the ring’s center gemstone. This creates two open spaces that gracefully frame the center gem. A split shank design gives a modern flair to a classic solitaire setting. The double band also gives an opportunity to add additional sparkling diamond accents to an engagement ring setting. Bands of sparkling pavé diamonds wrap around the shoulders and encircle the gallery, creating a radiant look in this alluring split shank design. This diamond embellished band parts at the shoulder to embrace and secure the center gemstone with elegant claw prongs. More diamonds encircle the gallery, creating shimmer from every angle. A glittering softened halo of diamonds surrounds the center gem in this elegant setting. A scalloped pavé split-shank band adds a stylish, dazzling effect. This artfully sculpted ring features ribbons of precious metal effortlessly extending into a graceful split shank setting. A scintillating halo of scalloped pavé diamonds surrounds a center gem set with claw prongs, creating a feminine yet contemporary look. The diamonds on this ring’s gallery and slight split shank band create an effect of magical shimmer. A halo of diamond accents curves gently around the center diamond in this distinctive ring. Two rows of pavé diamonds sparkle on the contemporary split shank band, while a surprise row of diamond accents on the bridge completes this glamorous look. Twisted vines of scalloped pavé diamonds leads to a delicately recessed halo around this ring’s center gem. Stunning diamond accents flow down the gallery for added brilliance. A halo of scintillating diamonds in marquise-shaped frames embraces the center gem in this exceptional ring. The precious metal band delicately splits underneath the halo for an alluring look. Finding a wedding band to match with your split shank engagement ring can present a pain-point for some brides. However, pairing a wedding band with your split shank engagement ring can not only be super easy, but also fun! Embracing small gaps can create an on trend look. Princess cut diamonds are the second most sought after diamond shape, right behind the traditional round brilliant diamond, and for good reason. Princess cut engagement rings have classic sparkle, modern lines, and glamorous style all rolled into one, making it the perfect cut for those who want it all. The modern round brilliant cut changed the world of diamond cutting forever when it was engineered in the early 1900s. This dynamic cut far out dazzled the old European cut, the old mine cut, the rose cut and the single cut. Jewelers then began to modify the round brilliant, maintaining its radiance while creating exciting new shapes. Around the same time as the modified oval shape was being invented, a Los Angeles diamond cutter named Israel Itzkowitz was working to create an early iteration of the princess cut diamond. What he created was far more brilliant than square diamonds that had been available up until that point. The combination of a geometric diamond shape with the brilliance of a round diamond was born, and it would soon become a prevailing favorite. Round brilliant diamonds are still the most popular diamond shape, fancy shaped diamonds are increasingly sought after and have amazing advantages. The princess cut, for example, will appear larger than a round brilliant diamond of the same weight, especially if you opt for a shallower cut. Princess cut diamonds also provide a higher yield from the rough cut diamond. This means that not as much of the diamond needs to be removed to achieve the desired shape, allowing the princess cut diamond to be slightly more affordable than round brilliant diamonds. Though princess cut diamonds look amazing with a vast number of ring styles, there are a few that truly enhance the beauty of the cut. A modern engagement ring setting obviously pairs well with a modern stone! If you love contemporary style and streamlined designs, consider a smooth bezel set ring. The clean lines and angles of princess cut diamonds look all the more elegant against the warm glow of lustrous rose gold settings. These stunning square gems bring a modern allure to antique or contemporary rose gold engagement rings. The combination makes for a classic look that is truly distinctive.